Corn Snake Lifespan – How Long Do Corn Snakes Live? Whenever you buy a new pet, it is very important to know how old that pet is going to get. I mean, there are a lot of different things to consider. Are you willing to take care of the pet if it lives more than 20 years? Maybe the pet doesn´t get too old, are you okay with that? Most people want their pet to live as long as possible, of course. The reason why you are reading this particular article is that you want to know how old your corn snake will get. 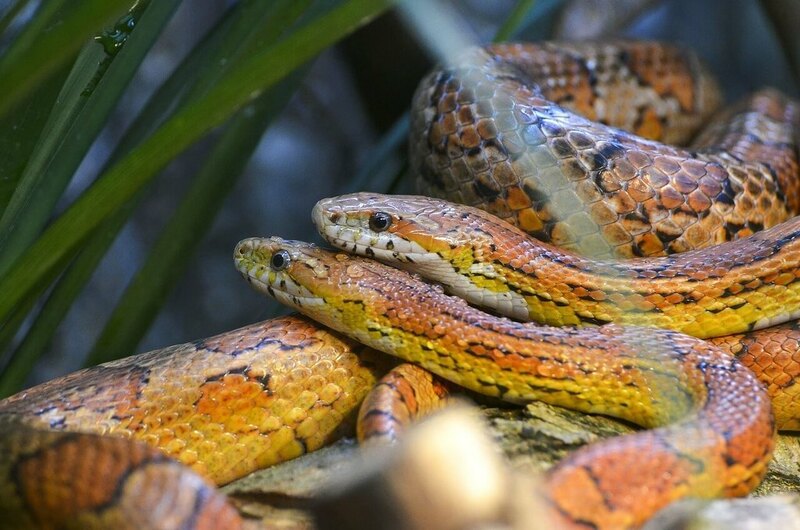 This article will show you exactly that AND how you make sure that your corn snake has a very long, happy and healthy life. How Long Do Corn Snakes Live In Captivity? Corn snakes live actually pretty long. They can get 20 + years old. The oldest corn snake I know is 30 years old. Unfortunately most corn snakes in captivity do not get that old. Why? The reason for that is, as always, bad husbandry. A lot of people buy their snakes from pet shops. The problem with that is that most of the time those pet shops have no clue how to take care of such a snake. They just give some basic information, maybe true, maybe false, and the buyers think they are ready to take care of the snake. Eventually the snake gets sick, needs to get checked by a vet or even dies. That´s horrible for the animal and for the keeper, too. That´s why I´d like to give you a couple of tips to make sure that your snake stays happy and healthy. Corn snakes are very hardy. That´s why a lot of people keep them in a plastic box with newspaper. In my opinion, if you are not a breeder, I don´t think this is an appropriate habitat for a corn snake. Further there are some very important things when it comes to corn snake husbandry, that you just have to get right. 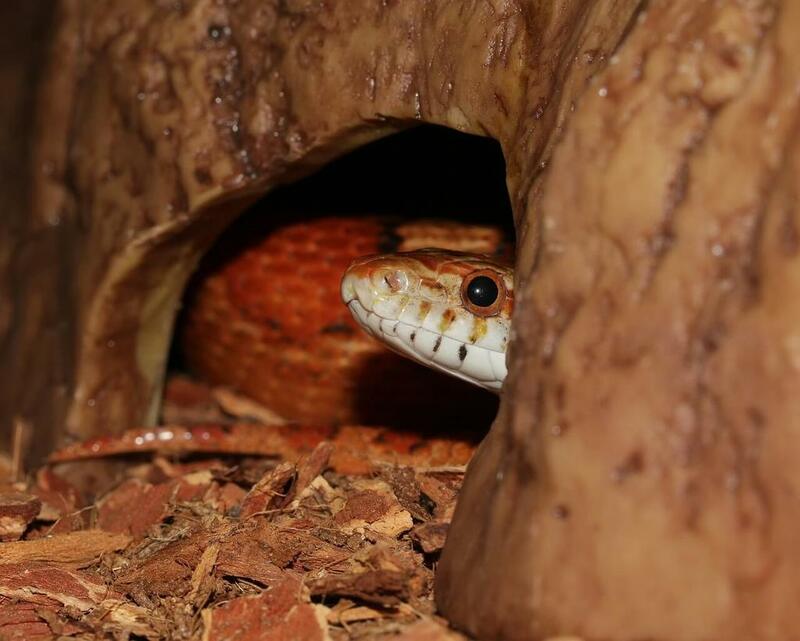 Corn snakes like to burrow themselves in the ground, so another substrate than newspaper would definitely contribute to their well-being. I recommend to get this substrate. Further this substrate holds humidity better, if you have problems with humidity. If you have a baby corn snake, or a sick corn snake in a quarantine tank, newspaper or kitchen roll is okay. Other than that, I recommend to get the bedding above. Corn Snakes need a humidity of 50% and above. Most people have problems with getting the right humidity. A too low humidity leads to problems with shedding. A too high humidity can lead to several diseases like lung inflammation or respiratory infection. In order to make sure that you get the humidity right in your corn snake enclosure I recommend to create a moist hide. This is the easiest method to make sure that your corn snake is well hydrated and is able to decide if it needs a higher humidity or not. Simple get a hide like this and fill it partially with this sphagnum moss. Make sure that the moss is a little bit wet (but not dripping wet) before you put it into the hide. There will be a microclimate inside the hide, with higher humidity, while the rest of your tank has a lower humidity. Of course, there are a lot of other ways to make sure that the humidity is on point. I wrote an entire guide on humidity, which you can read here. It depends on your budget and on your liking if you get a plastic box or a glass terrarium as enclosure for your corn snake. However, no matter what you get, you have to make sure that your corn snake has enough space. Corn Snakes like to climb, this is why you should get an enclosure that is wide and tall. Further the snake should have enough space to stretch. Because of that the enclosure should be as long as the snake. This terrarium is absolutely fine for a very long time. It always depends on how big your snake gets. 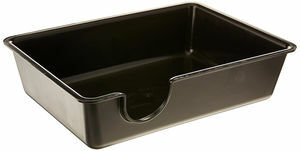 If you´d rather get a plastic box, get this plastic box. An absolutely confusing topic, especially for beginners. Actually, though, it isn´t really that complicated. As I already said, corn snakes are pretty hardy and tolerate a lot. So even if you don´t have the temperature on point yet, as long as it is not freezing cold, your corn snake will survive. That doesn´t mean that you don´t need to get it right now. One of the easiest methods is to get a heat mat like this and combine it with a thermostat in order to be able to control the temperature. If you need more information on this, read my temperature guide. Feeding is not that hard. You have to make sure that you don´t feed too often and don´t feed too seldom. Most people feed every 7 to 10 days, which is absolutely okay in most cases. If your corn snake doesn´t want to eat, simply put the food inside the terrarium during the night. Some snakes are shy when it comes to eating and want to be alone while eating. However, the food has to be dead if you do that. There are a lot of other things to know when it comes to feeding, but for this article, that´s enough. 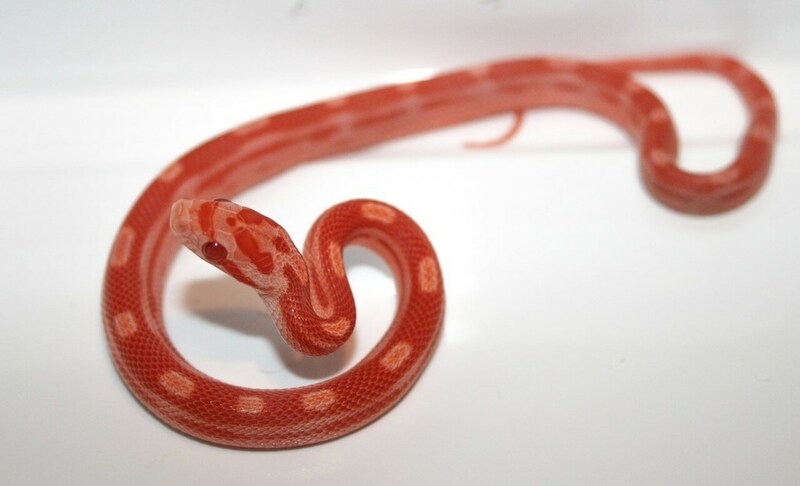 Your corn snakes has to have the possibility to get away from you and other stress. For that I recommend getting a hide like this. This way your snake can decide if it needs some alone time. Further you shouldn´t handle the snake too often. I don´t say, do not handle your snake, I just want to make sure that you know that you should give your corn snake a break from time to time. 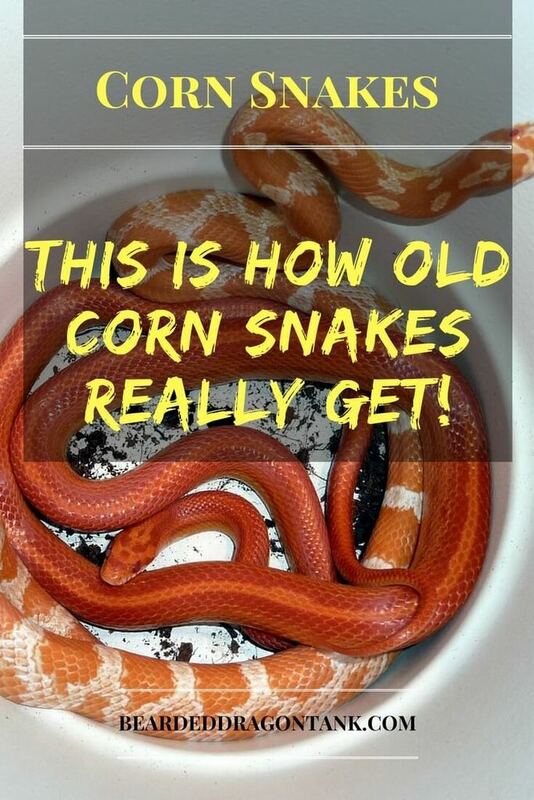 Corn snakes can get pretty old, the oldest I know of was 30 years old. If you want to make sure that your corn snake has a very long life, just follow my advice above. There are more things to know about corn snake husbandry, obviously. However this will give you an idea of what to do if you want to make your corn snake feel comfortable. If you have any further questions, leave a message in the comment section below and I will get back to you as soon as possible. 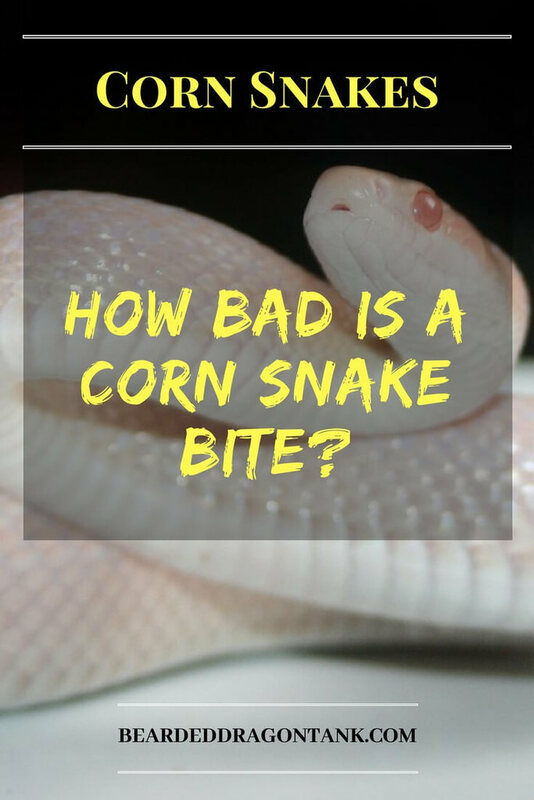 Author beardeddragontankPosted on May 6, 2018 Leave a comment on Corn Snake Lifespan – How Long Do Corn Snakes Live? Corn snakes are known for being very hardy. That´s why they are great beginner snakes. However that does not mean that they do not have any standards at all. Like all reptiles corn snakes need an enclosure with the right temperature, the right equipment, the right humidity and so on and so forth. The majority of first time corn snake keepers have problems with getting the right humidity. That´s why I want to explain you, what the right corn snake humidity is, how you can get it and very important stuff you should know when it comes to humidity. Corn Snakes come from the East Coast of North America. They live in a pretty big area, which means that they live in various temperature zones with various humidity levels and different environments. That explains why corn snakes are so hardy. When it comes to humidity, corn snakes tolerate a wide range of humidity. Still, it shouldn´t be too high nor too low. A humidity between 50% and 70% is perfect, however it is very hard to keep a humidity of 70% all the time. The good thing about it is that you do not have to keep 70% in your entire tank. It is okay if certain spots have higher humidity, but the average humidity in your tank is 45% to 50%. Too low humidity can result in shedding problems. This can be dangerous to your corn snake and it will be very annoying to you, as you have to help your corn snake with shedding then. Too high humidity might be even worse. Too high humidity can result in lung inflammation or respiratory infections and a couple of other diseases. A moist environment is the perfect environment for bacteria, so make sure you do not have moldy spots in your corn snake tank and that the humidity is not too high all the times. If you have problems to get the right humidity in your corn snake tank, here are a couple of things you can do to increase the humidity easily. 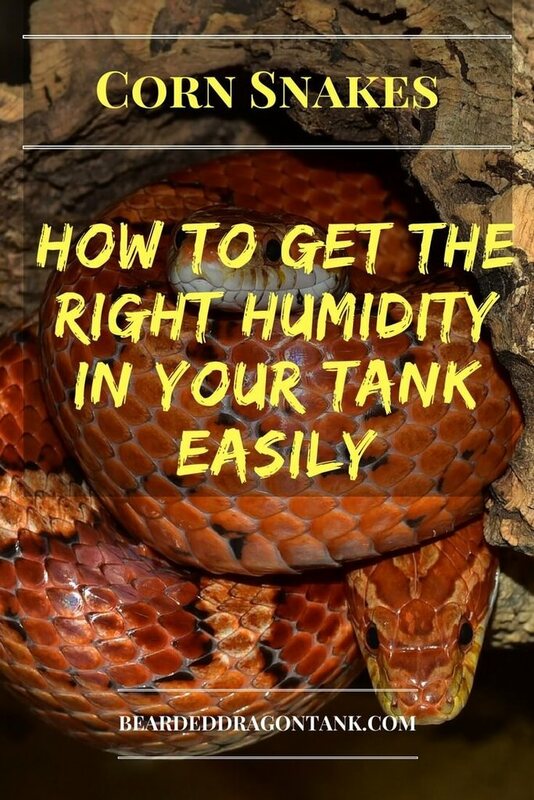 This is very easy to do and my favorite way to create the right humidity for a snake. A moist hide is great because the snake can choose if it wants to go into the hide or if it doesn´t need a higher humidity right now. A moist hide does not affect your whole corn snake enclosure, it is just a small spot with a microclimate which is very easy to control. Simply get a hide likes this and put some sphagnum moss inside it. Before that you have to mist the sphagnum moss a little bit. Do not make it dripping wet, just a little bit. Do not place the moist hide directly below or above the heat source as it will dry out quickly then. This hide box is perfect for creating a humid hide. Simply choose the needed size and get it at an affordable price. If you are using a heat mat you can just put your corn snake´s water bowl above the heat mat. The water with the warm spot will work like a humidifier then and the humidity in your corn snake tank will rise automatically. This is a perfect way to permanently have higher humidity in your corn snake habitat. If you are using a glass tank with a screencover as corn snake enclosure, maybe even with a heat lamp, you will lose a lot of humidity through the screencover. Most people cover a third or the half of the screencover with tin foil to keep the humidity inside the tank. However in my opinion a moist hide is way better than this method. If you still want to go with this method, just make sure that you do not burn down your house and put the tin foil, or whatever you want to use as cover, far away from the heat lamp. I know that most people use newspaper or kitchen roll as substrate for corn snakes. While this is a good substrate for quarantaine tanks or tanks for baby corn snakes, I don´t think it is an appropriate substrate for corn snakes in general. 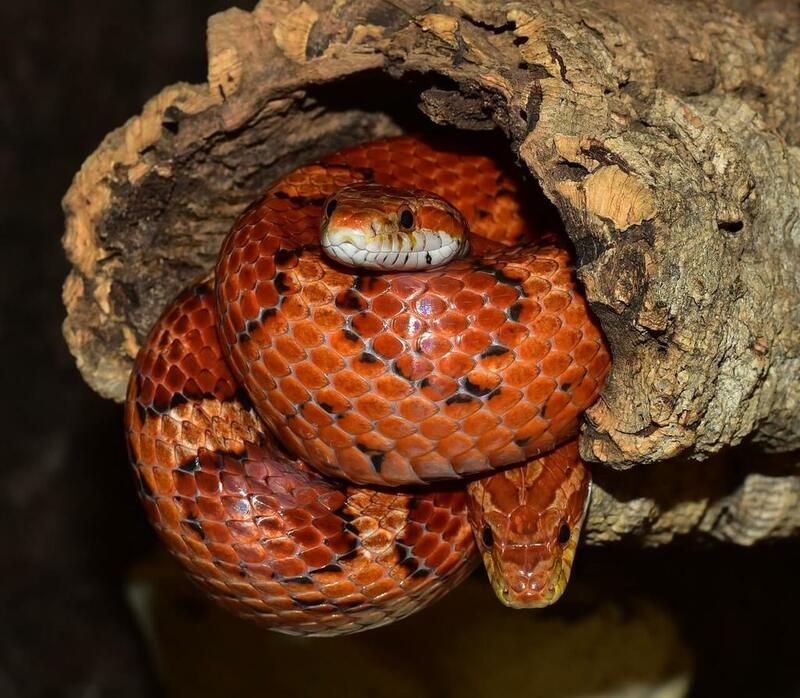 Corn snakes like to burrow itself and hide which isn´t possible with newspaper. Further a good substrate will increase the humidity in your tank. I recommend to get Forrest Floor in order to increase humidity. Simply mist it a little bit, the substrate will stay moist for a time without getting moldy. In my opinion the perfect substrate for a corn snake tank. Corn Snake On A Natural Bedding! If your corn snake feels that it needs some water in order to shed properly it will take a bath. A bigger water bowl can help here. Just make sure that you change the water on a daily base. Corn snakes sometimes defecate in the water, you have to disinfect the bowl then. Get this to disinfect your water bowl. Further, if your corn snake lies in the water bowl all day it might be a sign that the humidity in your tank is way too low or that your corn snake might be sick. 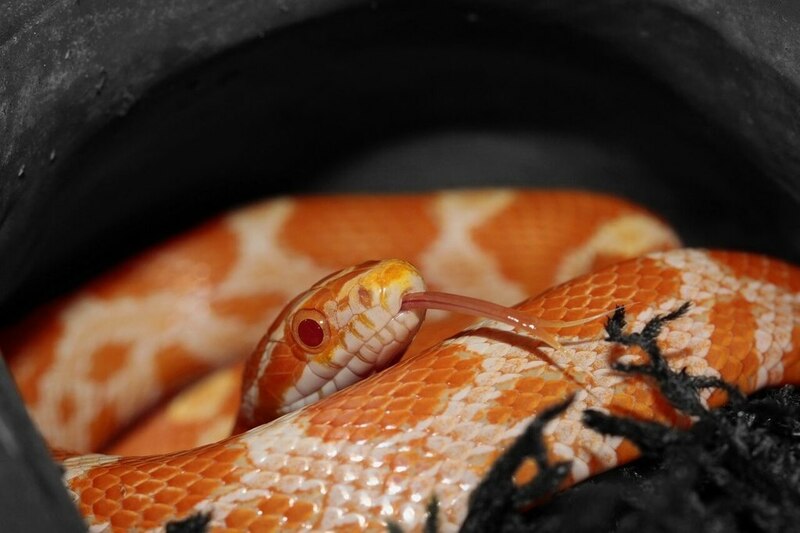 Often corn snakes lie in the water bowl all day when suffering from parasites that itch badly, like mites. You should check your corn snake if that´s the case. An obvious way to decrease humidity is to do the opposite of what I have described above, obviously. However there is one method I want to show you if you use a plastic box as corn snake enclosure. As you know now, too high humidity is even worse than too low humidity. If you have very high humidity in your tub all the time you should drill a couple of holes in the sides of the tub. If you already have some holes there I recommend to create a couple of holes more. The humidity will decrease with every hole. This makes it really easy to reach the right humidity in the box. I recommend to not worry about humidity that much. It always depends on your snake. Is your snake shedding well with any problems? If yes, the humidity is absolutely perfect and you don´t have to change a thing. If your corn snake has problems with shedding, you need to increase humidity a little bit. Further make sure that your snake is always well hydrated, because that´s the actual reason for perfect shedding. So a water bowl is necessary at all times. If you have any questions, leave a message in the comment section below and I will get back to you as soon as possible. Don´t you just hate it when you are freezing and your house just doesn´t seem to get warm? I hate that, freezing all the time is really anoying and let me tell you something, your reptile doesn´t only hate it, too low temperatures can even kill it. 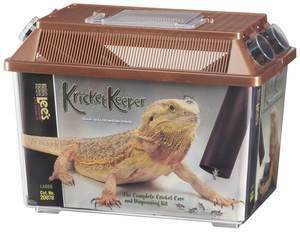 Most reptile keepers have problems with getting the right temperature in their reptile enclosure. Especially for beginners this topic can be pretty confusing. I mean, what should you get? A heat pad? A heat bulb? A ceramic emitter? There are tons of different possibilities to heat your corn snake enclosure. 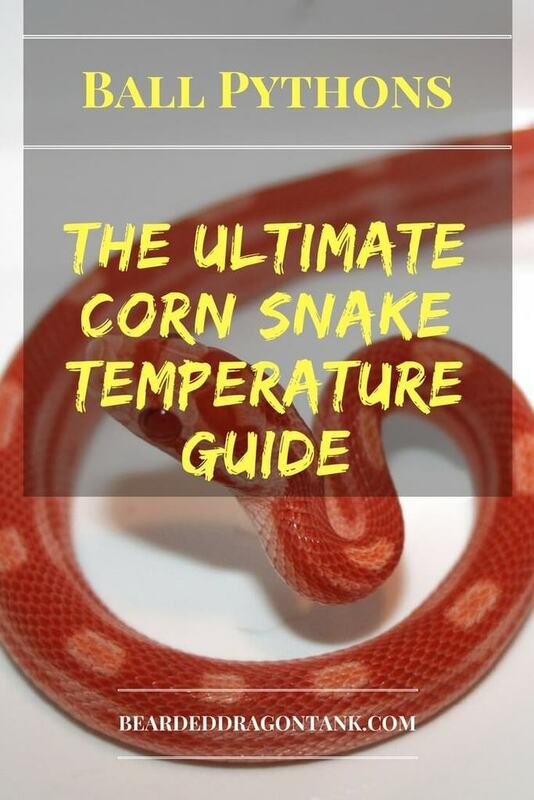 In this article I am going to explain you what the right corn snake temperature is, how to get it and what you need for it. After reading this article, this topic won´t be confusing at all anymore. So let´s get right into it! To make it easy for you, I will separate this in a few different sections so you exactly know what temperature you need and when and where you need it. This is the temperature in the whole terrarium. You want to have cool zones and warm zones in your corn snake enclosure so that your snake is able to get a higher body temperature and to cool down as well if it needs to. The ambient temperature should be from 75 °F (23 °C) to 81 °F (27 °C). You need to create a hot spot for your corn snake. The hot spot is the warmest place in the terrarium. Corn snakes and other reptiles use that to get their body on temperature quickly whenever they need it. You will most probably see your snake under the hot spot every morning. The hot spot should get 86 °F (30 °C). You should create a day and a night cycle in your snake enclosure. The temperature should drop at night to around 68 °F (20 °C). In order to create the right temperature, you need the right equipment. I know that there are tons of different methods to get the right temperature, but I want to make this easy for you. That´s why I show you the most common/ easiest ways for heating your corn snake enclosure. 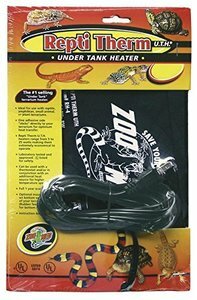 I know that most snake keepers prefer to get a heat mat, because they think their snake needs “belly heat” in order to digest their food. That´s not true. They need to get their body on temperature to digest food, that´s it. If the heat comes from above or from below is irrelevant. I like to create natural habitats and that´s why I prefer to have heat bulbs, because in the wild the sun comes from above as well. Further I think that heating with a heat bulb is the easiest way to get the right temperature. Simply get a 100W incandescent bulb that gets warm, get a fixture for the heat bulb and place it on your tank´s screencover. If the temperature is too high or too low you can get a bulb with higher or lower wattage. However 100W is fine in most cases. If you don´t have a screen cover, or if you use a box as enclosure get a lamp stand like this. Don´t get me wrong, there is nothing wrong with heat mats. Most people use them and have no problems at all. Heating with a heat bulb is just my preferred method. So if you want to use a heat mat, make sure that you only cover a third of your enclosure´s bottom. Otherwise your corn snake won´t have any room to cool down. Further you must get a thermostat as well if you want to heat with a heat mat. Otherwise you won´t be able to regulate the temperature and the heat mat will get hotter and hotter. I recommend to get this heat mat and to get this thermostat. You can also combine a heat mat and a heat bulb. Most people do this in bigger enclosures. You can also do this if you don´t reach the recommended temperatures. Create a hot spot with a heat bulb and place the heat mat on the cooler side to make sure that you get at least 75 °F (23 °C) on that side. Heating with a heat mat is probably the easiest way to get the right temperature in the snake enclosure. This mat is highly rated and inexpensive. Please don´t get one of those plastic thermometers that you can stick inside your tank. Those thermometers are totally worthless. They don´t show the right temperature and the problem is that you can´t measure the temperature in different areas. Get a Temp Gun instead. These guns are awesome, you can measure the temperature wherever you want in a matter of a second and you know exactly if everything is alright in your corn snake tank. Get a Temp Gun Here! You will most probably find tons of information on this topic and many people will say that you need higher temperatures or maybe even lower temperatures. That´s just the way it is in the reptile world. There are a lot of people with different opinions. What I want you to know is that your corn snake is very hardy. I don´t want to tell you that you don´t have to take proper care of your snake because of that. All I want to say is that your corn snake won´t die if the temperatures vary a little bit from time to time. So don´t give yourself a hard time if your cool zone is 73 °F instead of 75 °F at times, for example. As long as this is not the case at all times everything is fine. 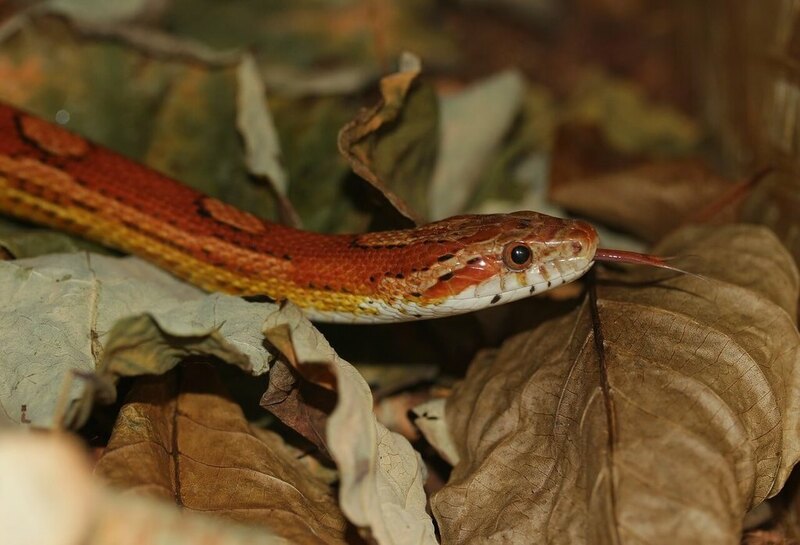 Corn snakes are pretty hardy, but that doesn´t mean you don´t need to take proper care of them. Getting the right temperature is not that hard if you know the right way. The two methods above are the easiest methods to create the correct temperatures, so you shouldn´t have any problems with that anymore. Still, if you have any questions, leave a comment in the comment section below and I will be more than happy to help you out. Do you want to get a corn snake or did you even already got a corn snake and you are now asking yourself how big they get? Maybe you are afraid that these snakes get too big. So big that you don´t know if you have the courage to still handle them. Maybe you are just worried, because you want to get this snake for a child in your family. Or you are just worried about the tank size they need, because you don´t have that much space in your room/ house. There are tons of different reasons why this should be important to you, but in the end, it doesn´t really matter. Why? Well, I am going to explain this to you in this article. 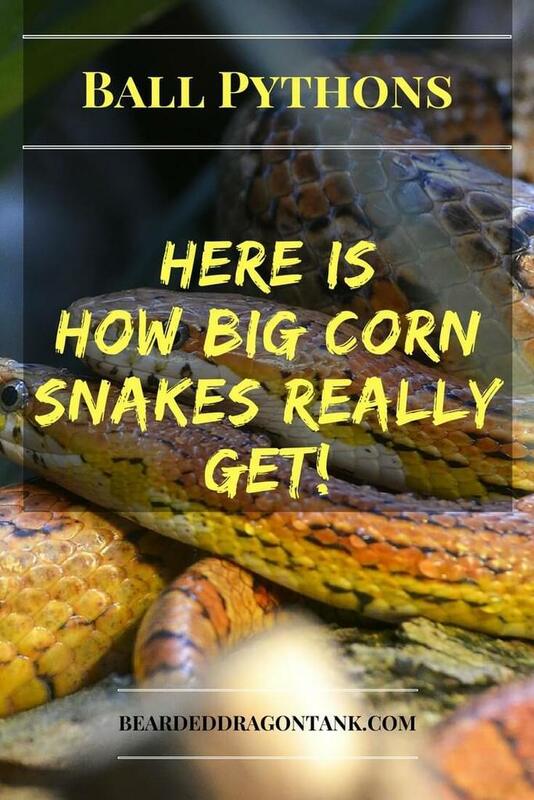 This article will show you how big corn snakes get, what tank size they need and everything else you should know about their size. 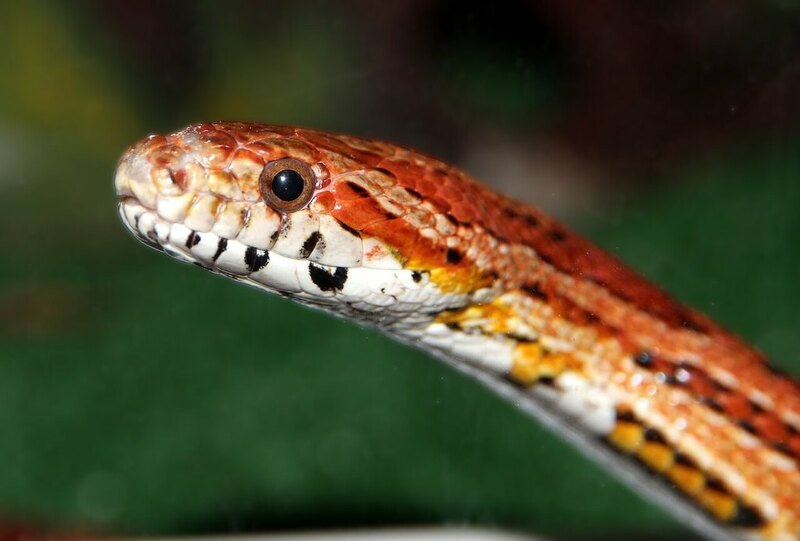 What Is The Best Corn Snake Tank Size? So how big do they get? That depends on a lot of different factors. First of all, females get bigger than males. Females can get become 5.9 ft long and males can get 4.6 ft long. However, as I said, they CAN get that long. The truth is that a 5.9 ft long female is the longest corn snake I have heard of. Actually I rarely see corn snakes that get over 4.6 ft. I can´t explain why, maybe the snakes here aren´t that big (but I doubt it). Maybe most corn snake keepers fib a little bit when it comes to corn snake size. Besides that, it really takes very long for your corn snake to reach that size. When your corn snake is one year old it will be most probably around 2.2 ft long. Compared to the a size of 10 inches, which is the average size of a freshly hatched corn snake, this is a huge difference. From that point on, however, your corn snake will really slow down when it comes to growth. With 5 years old, you corn snake may have reached a length of 3.9 ft. That varies, of course. That´s one reason why their size doesn´t really matter. And here comes the other reason why their size doesn´t really matter. Corn snakes do not need a huge tank. Don´t get me wrong here, bigger is always better, but most of the times a tank that is 36 inches in length and height is sufficent. Corn snakes do climb a lot, that´s why it is very important to give them the possibility to do so. So I highly recommend to get a tank that´s tall as well. I like this tank very much, because it has a great ventilation system. However you might rather want to keep your corn snake in a plastic box. If that´s the case, I recommend to get this plastic box for your corn snake. I said it above, corn snakes do not grow fast after their first year, that´s why you can get a smaller tank at the beginning and whenever you need it, get a new, bigger enclosure for your corn snake. The rule of thumb is that the enclosure should be as long as the snake. This way the snake is able to stretch in the enclosure, which is very important to avoid any health problems. The growth of your corn snake depends on genetics and on the feeding. 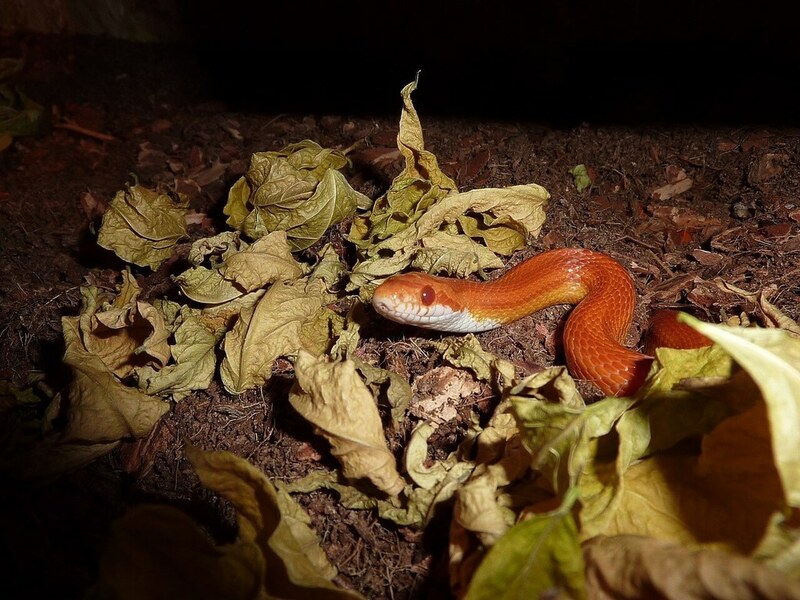 Most people think that you shouldn´t feed your snake to seldom and this is absolutely right, but you shouldn´t feed your corn snake to often either. In fact it can be more harmful to feed your snake too often. You might think that your snake is full after one mouse, but your snake will eat whenever you offer food. That´s their natural instinct. So I recommend to feed every 7 to 10 days. Most corn snake do not get as big as most people say they get. In fact, most corn snakes will not even get 40 inches long and that is absolutely okay as long as the snake is healthy. Even though corn snake are said to be a middle-sized snake, most of them are rather small and that´s why you don´t have to get a huge enclosure. At the end the size doesn´t really matter at all. They are known for being great beginner snakes, because they are pretty hardy and very friendly. No need to be afraid of the bite of a big snake here. I really hope that this article was helpful to you. If you have any questions, leave a message in the comment section below and I will be more than happy to help you out. Most people are scared of snakes. Even though most snakes are not dangerous at all, the majority of people just have this picture of a dangerous snake in their minds. A snake that is poisonous or a snake that can squash your complete body and swallow you in one go. The truth is that most snakes won´t even try to bite you. Some will try to avoid you if they don´t want to be touched, some will do nothing at all and some will bite you. It depends on the snake. So what about corn snakes? How bad is a corn snake bite? Are they known for being aggressive? What can you do about it, if yes? If you need an answer to all of these questions, you came to the right place. So let´s get started! Your Corn Snake Bites? Here Is What You Should Do! Just Fed Your Corn Snake? Do This! Your Corn Snake Doesn´t Let Go – What Now? Let me guess, you are thinking about getting a corn snake or you might already have one and now you are a little bit scared of touching it? Don´t worry about it. Most snake keepers start like this. You might be afraid of the bite, but the snake is still fascinating to you and this is really awesome. Corn snakes are know for being pretty relaxed when it comes to handling. Most people say that they are one of the best beginner snakes, not only because they are very hardy, they rarely bite and do not get too big. Most baby corn snakes are a little bit more aggressive, but get calm as they grow up. So if your young corn snake is aggressive now and you might be worried that your snake can´t be “tamed”, just give it some time. It is likely that your snake will get more relaxed. It is a normal behavior in most snakes to be more aggressive as babys in order to survive in the wild. Further young snakes are not used to humans and they are not used to being touched by you. If you have a very young and small corn snake it doesn´t hurt at all. In fact I encourage you to get bitten by your snake. I will explain why later in this article. Most of the time the snake does not really want to bite. It just wants to keep you away from it. So it hisses, rattles the tail and shows a couple of faint attacks if you get to close. If it touches you, you will feel that it is more a punch than a real bite. The snake doesn´t really bite your hand. When it comes to a bite of an adult snake it can hurt a little bit, but to be honest, it is just a matter of getting used to it. If you get bitten and you truly ask yourself if it did hurt, the answer will be no. You might scream a little bit because you are shocked or surprised, but it is no real pain. So the bad thing about it is your shock, but not the bite itself – if the snake bites at all. If you really are afraid of the bite, here is my recommendation. Stay calm, put your hand in the tank and let the snake bite you. Again, stay calm, don´t pull your hand away, just let it happen. Why do I recommend such a nonsense? Have you ever heard the saying “Fear – the best way out is through.” ? This is what I am talking about here. If you do that you will realise that the bite isn´t really painful. If you have a baby snake you will see that it doesn´t hurt at all. Maybe you will even realise that your snake doesn´t want to bite. The fear makes this whole situation worse, so go through it. 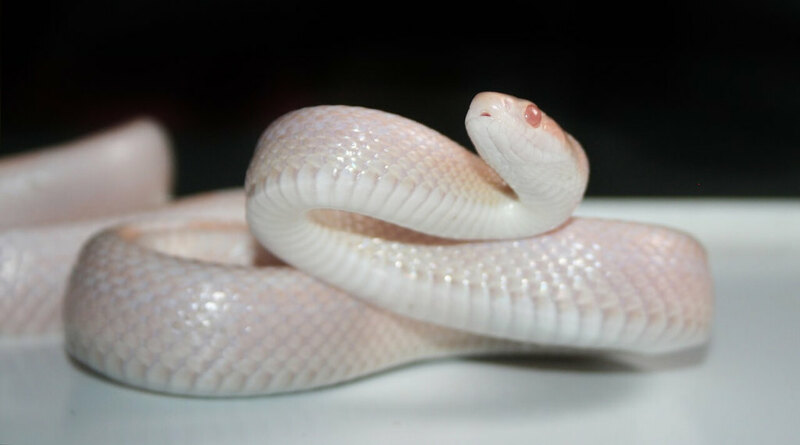 Further you should know that this will even help your snake to get more relaxed with you. The snake will feel that you are not that nervous anymore when you lost your fear and therefore won´t be that nervous either. No normal person wants to get bitten all the time. So here are some recommendations which will help you to not get bitten by your corn snake. You will probably feel a little bit like the Crocodile Hunter when getting a snake hook, but trust me, this thing can really help. Most snakes will even be more calm when you get it out with a snake hook as they feel that the hook is not a living thing. Further it is easier to keep your snake´s head away from you and make it impossible to get bitten. Of course this is not really needed if you have a baby corn snake, but if you have an aggressive adult corn snake, this will be a huge help. Get a snake hook here! 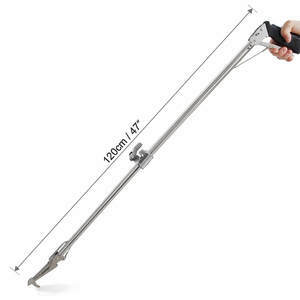 Below is a short video of two guys using a snake hook properly. In the wild all the things that come from above are dangerous for snakes. If you grab it from above your snake might think that you are a huge bird that wants to attack. Try to grab your snake near the head from the side. If you want to get your snake out and fear kicks in, your snake will have time to realise what you are about to do. The longer you wait, the worse it gets. Just open the cage, lift up the hide, if your snake is in there, and grab the snake. Try to grab as much snake as possible so that the snake can wrap around your fingers, hand or arm. Another reason why I recommend to get rid of your fear first. If you are nervous, it might happen that your grip is too tight and your snake gets nervous. A tight grip can even damage the corn snake´s organs. Always make sure that your snake can move smoothly through your hands when handling. It will also show your snake that you don´t have bad intentions. Excellent for preventing your snake from biting you. This will help as well to get more relaxed when handling your snake as you know that the snake can´t really get through the glove. Further most snakes do not like to bite rubber gloves and won´t try again after the first bite. So I recommend to get rubber gloves here. If you just fed your corn snake it might be that your hands still smell like your corn snake´s prey. If you try to touch it now, your corn snake might try to bite and to eat your hand because it thinks your hand is food. Wash your hands after feeding your corn snake. I recommend to not touch the food at all. Get some tweezers here and feed your corn snakes with tweezers only. Nevertheless you should still wash your hands after feeding. Your corn snake will show you that it wants to bite you. Most of the time it will form an S with it´s body to attack. Further it will “pump” a lot when it is stressed. The “pump” means that it breathes heavily, which you can see. The body seems to get bigger and smaller over and over again. I already told you about the hissing and the rattling above. All those signs will show you that you might get bitten. It rarely happens, but it can happen, so I want to tell you what you should do if your corn snake tries to eat you. First you should stay calm. It might be a weird feeling, but it doesn´t hurt that much. Don´t rip your snake off, you could seriously hurt it by doing so. To get it off you, water can help, so go to the kitchen sink and let the water run on your snake´s mouth. If it doesn´t want to let go, try to get between your skin and your snake´s mouth with a pencil or with tweezers and carefully open your corn snake´s mouth. The truth is that corn snakes rarely bite. If they bite, it doesn´t really hurt. They are not big snakes and they do not have big heads, no big jaws, no huge teeth. There are multiple ways to avoid getting bitten by your snake, but I really recommend to get bitten by your snake to get used to the situation. This way you will be more relaxed when handling and your snake will feel that and will be calmer as well. If you have any further questions, please leave a comment below and I will be more than happy to help you out. You are probably new to chameleons and you are looking for tips on how to take care for chameleons. Well, there are a lot of different types of chameleons and not every chameleon can be kept like the other. However when it comes to chameleon food, all chameleons eat the same. A lot of insects! However I know that you most probably need a little bit more information than that. Which insects? How many of them? How to feed a baby chameleon? How to feed an adult chameleon? Can I feed vegetables? Can I feed fruits? And probably a bunch of other questions go through your head right now. Don´t worry, all of your questions will be answered with this article. Further you are about to read a very important information on chameleon diet that you are most probably not aware of …uuhhh mysterious..lol. Can Chameleons Eat Fruits And Vegetables? Gut Loading Is The Answer! What Size Should The Feeder Insects Have? How Much Should Your Chameleon Eat? …consists of a lot of crawlies. If you are new to reptiles this might be a little weird and maybe a little bit disgusting to you. That´s absolutely okay. I felt a little bit weird as well when I bought the first crawlies for my reptile and stored them in my room. However that will change in a couple of weeks. It will be totally normal to you to have boxes with crawlies in your house. Even if you are afraid to touch crickets now, you won´t be anymore in a month…. but back to the chameleons! So chameleons should eat crickets, roaches, locusts and other insects. By the way, I have written specific diet guides for panther chameleons and for veiled chameleons. If you have one of these and need more specific information, click on the names. Crickets are most probably the most popular feeder insects. That doesn´t mean that you should feed only them to your chameleon. In fact, crickets are not that healthy. 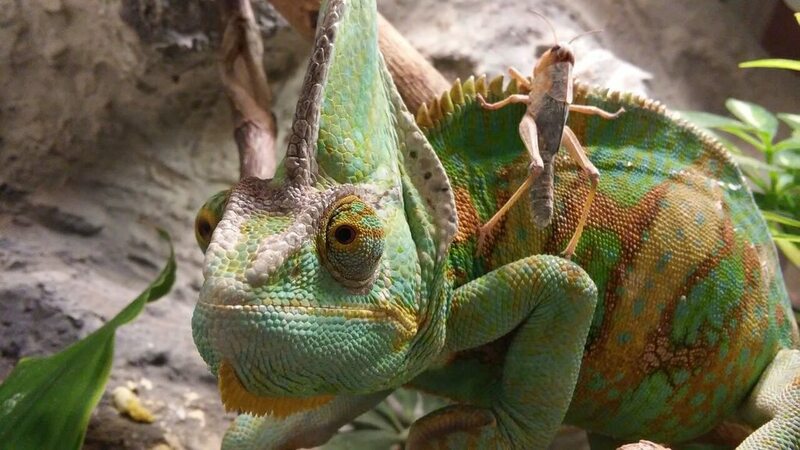 There are feeder insects that are way healthier for your chameleon. The dubia roach for example is way healthier than most feeder insects. I know, I know, it is a roach and most people do not like roaches. However dubia roaches are silent feeder insects unlike crickets. They can´t reproduce in your house if they escape because they need high humidity and high temperature at all times for that. Still, you should not feed the same feeder insects each and every week. You should offer a variety of feeder insects. Buy a box of crickets this week. A box of locusts next week and get some dubia roaches after that. Flies are awesome as well. Release them in the chameleon tank and watch your chameleon shooting all the flies. Dubia roaches are one of the healthiest feeder insects. I highly recommend them! Weeeeell… most of them are not that healthy. For example most people feed meal worms over and over again. The problem with that is that meal worms are not healthy at all and they are like the fast food among the feeder insects. Meaning your chameleon will get fat if you feed them too often. Chameleons love meal worms and super worms and that´s why most people like to feed them, because their chameleon goes crazy over them. If your chameleon is malnourished or sick and needs to gain some weight quickly, meal worms can help. Other than that there is not really a reason to feed them at all. A panther chameleon “shooting” a cricket. Dry food seems to be a good alternative if you don´t want to deal with feeding living crawlies. Chameleons should not eat dry food, though, and in most cases the chameleon will ignore the dry food. 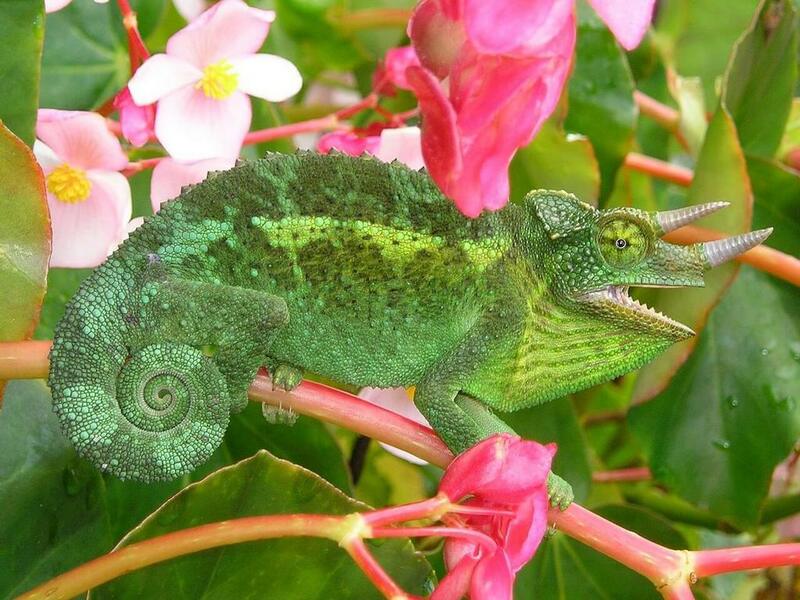 The reason for that is that chameleons only eat living insects. They do not touch dead insects, because it is not healthy for them. A chameleon that eats dead insects is a very hungry chameleon. Besides that chameleon only eat things that move. Have you seen those cute videos on Youtube where a person shares a banana with a chameleon? Cute, right? It really is, but unfortunately it is not that healthy for chameleons. Okay let me explain to you why you should not feed fruits and vegetables. Let´s start with fruits. Fruits contain a lot of sugar. Should a healthy chameleon eat sugar? It shouldn´t. A banana, for example, is very high in sugar and because of the consistency, can be dangerous for your chameleon. Actually your chameleon can get impacted from that. What about vegetables. Most vegetables contain a lot of water. While chameleons definitely should be well hydrated at all times, too much water can lead to diarrhea. Diarrhea leads to dehydration. So feeding a chameleon with fruits and vegetables most is not really healthy most of the times. Mostly it will irritate their digestion. Most chameleons only get around 5 years old, why put them in danger and potentially shorten their life expectancy with feeding this stuff? Besides that, most chameleons only eat greens or fruits when they are dehydrated. So making sure that your chameleon is dehydrated is what really matters here. Chameleons need vitamins though and here is how you feed your chameleon very healthy stuff. So chameleons should get vitamins from vegetables and fruits without feeding them vegetables and fruits. How to do that? Easy! Feed the feeder insects with fruits and vegetables before feeding the insects to your chameleon. Here is how you do that, you can see this as a recipe for healthy chameleon food. 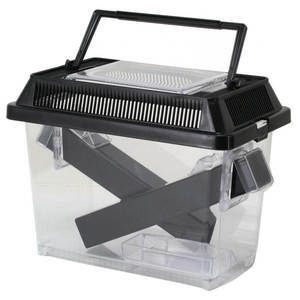 Get some crickets, locusts or roaches and put them in a cricket feeder box like this one. In this box the feeder insects will have a lot of space. Sometimes the insects attack each other in the small feeder boxes you get from pet shops. The result is a lot of dead feeder insects. In the end that´s a waste of money. Excellent for housing feeder insects and keeping them alive and healthy. Okay you have your feeder insects in the feeder box. Now put some healthy fruits and vegetables for the insects in it. Don´t use any moldy food or food that you were about to throw away. Make sure that the fruits and vegetables are fresh and don´t get moldy in the box. After eating veggies or fruits, your feeder insects are gut loaded which means they are full of vitamins. Your chameleon will absorb those vitamins when digesting the feeder insects. That depends on your chameleon´s age. Baby chameleons should eat every day. They are growing quickly and will eat a lot. When I say a lot I mean even more than a lot. A full box of micro crickets is a daily meal for most baby chameleons. Of course, this depends on the type of chameleon you have. Adult chameleons should not be fed every day. You should feed your adult chameleon 5 days per week. Chameleons can get fat without you even noticing it. Their organs get fat. This can lead to horrible diseases and very often those diseases cause death. I am talking about fatty-liver disease for example. So even though your chameleon would most probably eat every day, you should definitely have fasting days. You should not feed too large feeder insects. 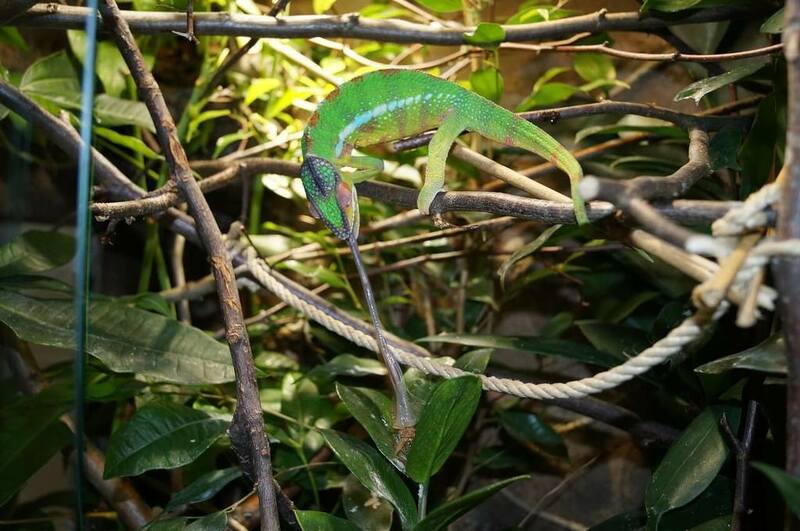 Feeder insects that are too large can cause injuries at the mouth or irritate your chameleon´s digestion. It can happen that your chameleon isn´t able to eat huge insects and the insect comes out undigested. Nasty and not healthy. If you have one of those beautiful, majestic, sophisticated parson´s chameleons (too much? ), you can feed them large locusts and huge roaches. Panther chameleons and veiled chameleons should eat medium sized feeder insects, for example. Rule of thumb is the feeder insect should not be bigger than the width of your chameleon´s mouth. Hope that sentence made sense … sorry, English isn´t my mother tongue. Just make sure that it fits into your chameleon´s mouth easily. The insects should not be too small either, your chameleon will not eat them then. 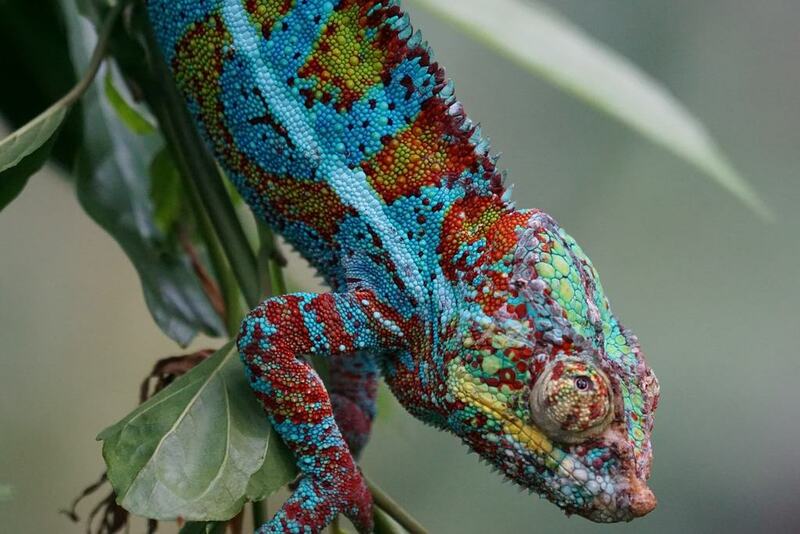 A majestic parson´s chameleon. Very rare! This depends on a lot of different things. What type of chameleon do you have? How old is your chameleon? How big are the feeder insects? While baby chameleons should eat a lot every day, you shouldn´t feed too many feeder insects to your adult chameleon. As I said, they get fat quickly. If you have a panther chameleon or a veiled chameleon you should feed around 5 medium sized feeder insects on a feeding day. This depends on the feeder insect and on you. If you are brave, you can feed your chameleon with your bare hands. You can also feed with tweezers. Some chameleons might accidentally shoot the tweezers or your fingers instead of the insect. Most chameleons do not let go then and this can hurt their tongue. So you might be on the safe side if you just put a box with the feeder insects inside the chameleon cage. If you want to “tame” your chameleon. Feeding the chameleon with tweezers will help. Some insects attack your chameleon so I would not just release them inside the cage. Except for flies. The cricket pen of this cricket feeder box will help you to get the feeder insects out of the box. This way now insect can escape and run around in your house. Watching a chameleon hunting food with their awesome tongue is amazing and it fascinates me every time I feed my chameleon. As you see, feeding a chameleon is pretty easy. The feeding depends on the type of chameleon you have though. 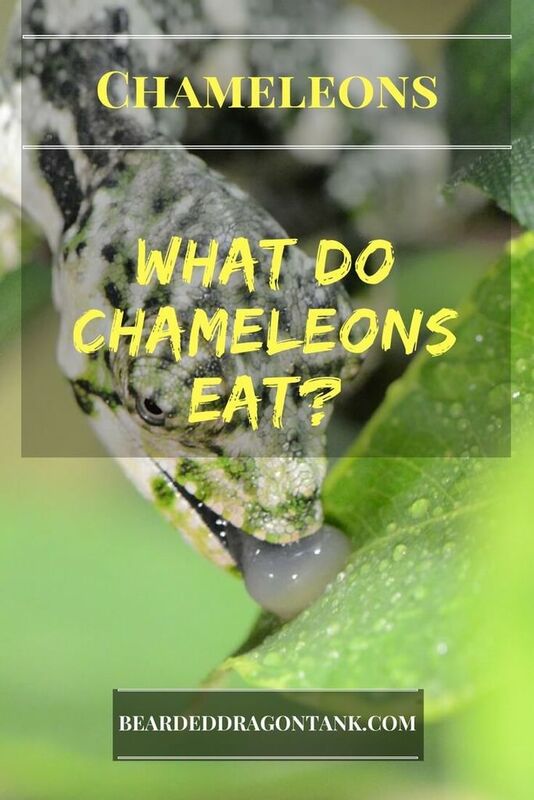 I hope this article helped you and answered your question “What Do Chameleons Eat?” properly. If you have any questions, leave a message in the comment section below and I will get back to you as soon as possible. If you want to get a chameleon or if you already have one, you probably noticed that you have to do a lot of research when it comes to taking care of your new little reptile friend. You need to create the right housing conditions for example. Part of that is the chameleon lighting. A pretty confusing topic, right? I remember when I got my first chameleon I did everything wrong regarding the lighting. I was confused and I was misinformed. Unfortunately my chameleon got very, very sick because of that. This won´t happen to you though, since this article will tell you exactly what parts you need for the perfect lighting and why you need it. Which Light Bulbs Do Chameleons Need? What Is The Best Heat Bulb? To make things easier for reptile beginners I like to split this topic into two sections. So the first section is UVB. You might have already heard or read of it. UVB bulbs are very important for chameleons and you must get one of these. Chameleons need UVB to produce vitamin D3. Vitamin D3 is needed to process calcium and calcium is needed for solid bones and for their growth. If you do not get a UVB bulb your chameleon won´t grow and eventually it´s bones will get soft. This is called metabolic bone disease. It is a horrible disease that always ends with death if not treated. As I said, the bones will get soft, the whole body of the chameleon will get deformed. Your chameleon won´t be able to shoot crickets anymore and eventually it won´t have enough power to climb on trees. Most of the times you can see those sick chameleons on the ground shaking, unable to move properly. It is horrible and it means huge suffering for the chameleon. Okay, I think I made clear why you need such a bulb. It always depends on the type of chameleon you have. Some chameleons are okay with stronger UVB bulbs. Others do not need that much UVB and you can go with a bulb with a lower UVB output. However in almost any cases this UVB bulb is absolutely perfect. This UVB bulb is known for being the best on the market. Not only for chameleons, it is also used for bearded dragons for example. The good thing about it is that it comes with a fixture at an affordable price. You can even get this bulb in several sizes. I recommend to go with the size that is equal, or almost equal, to your chameleon tank´s width. 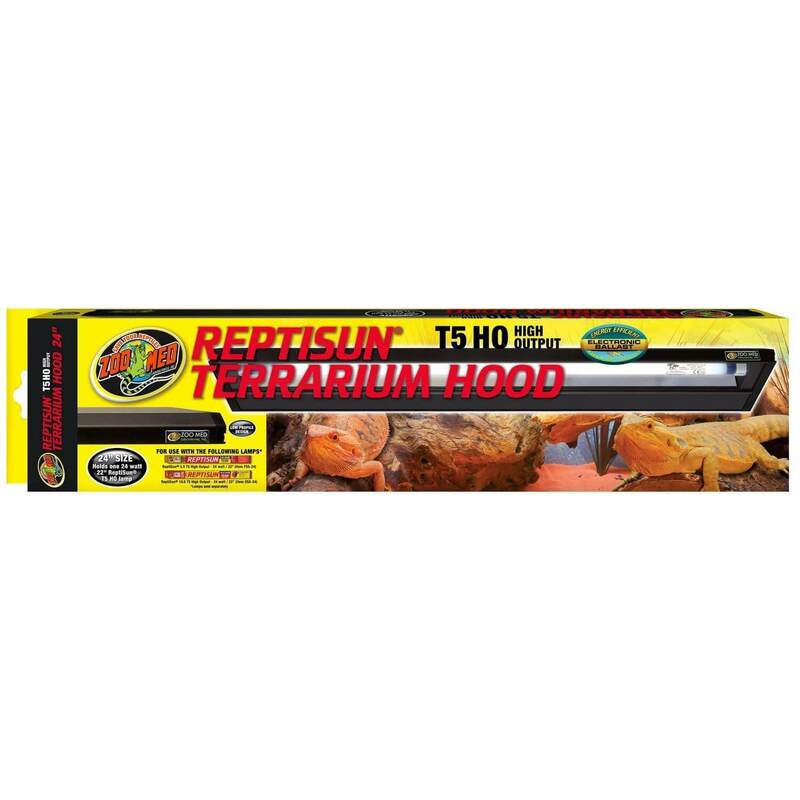 The ReptiSun is one of the best, if not the best UVB bulb on the market. It comes with a fixture at an affordable price. UVB bulbs get weaker with time. Most people recommend to replace the UVB bulb once a year. I recommend to replace it every six to eight months. This way you make sure that your chameleon gets enough UVB at all times. Further you must know that UVB rays can´t go through glass. So you need an enclosure with a screencover on the top. This tank is great for most chameleons. Besides a UVB bulb you also need a heat lamp for your chameleon. Why do you need it? Chameleons are cold-blooded, like all reptiles. This means that they need their environment to control their body temperature. They don´t have a steady body temperature like we have. If a chameleon doesn´t have the possibility to warm up it´s body, it won´t be able to move. Without a heat lamp your chameleon will sleep all day. If it awakes, it won´t be able to move properly. Most chameleons that need higher temperatures will die if the temperature is always too low. So you need to get a heat lamp so that your chameleon will be able to get it´s body on temperature. Further you need to create different temperature zones so that your chameleon is able to control it´s body temperature perfectly, meaning that it also needs cooler places if it´s body temperature gets too high. Here is how you do that. What a beautiful panther chameleon! Most chameleons need a hot spot. That´s the place below the heat lamp. A branch or a log below the heat lamp is perfect for that. Of course the hot spot should have a certain temperature, but the needed temperature depends on the type of chameleon. So I can´t tell you the temperature here. If you need help with that, leave a message in the comment section. I will get back to you. The warm area is in the upper section of your chameleon enclosure. It will be created automatically by the heat lamp. Again, what temperature your chameleon needs depends on the type of chameleon. The cool zone is in the lower section of the tank. You will find your chameleon near the ground if it needs to lower it´s body temperature. You can take one of those reptile basking lamps for your chameleon. However a normal incandescent bulb that gets warm will do the job as well. You might ask yourself what wattage you need. 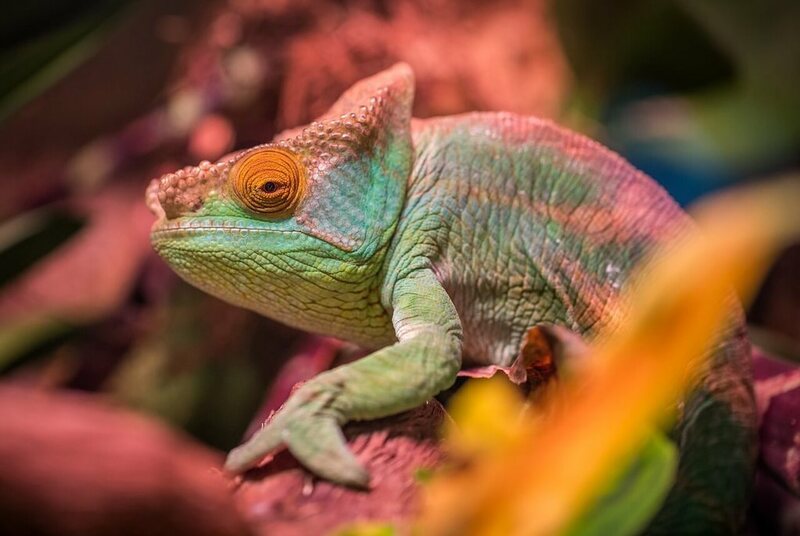 Well, the higher the wattage the higher the temperature … what wattage you need depends on the type of chameleon and on your tank size. Normally bigger tanks need lights with higher wattage. You also need a fixture for your heat bulb. I recommend to get this fixture. It has a built in reflector and you can place it on top of the screencover. If you are afraid that the screencover could collapse, get this lamp stand. Since I do not know what type of chameleon you have I want to give you a tip on how to make sure that the temperature in your tank is okay. 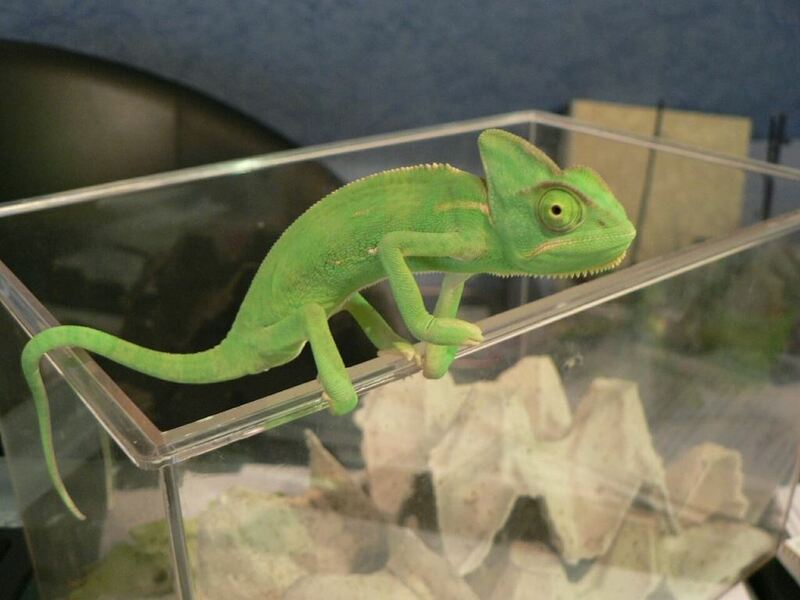 You must be sure that your chameleon is healthy though, as weird coloring could be a sign of stress or a disease. If your chameleon is black all day and sits very near at the heat bulb at all times, your temperature might be too low and you need a heat bulb with higher wattage. If your chameleon is near the ground all day, your temperature might be too high. I see those dark terrariums all over Youtube. Chameleons need a lot of light. Dark terrariums are not optimal for them. So make sure that you have a bright light. Although with the two bulbs I recommend above you should be fine. You need to have a lot of plants in your chameleon tank. Most chameleons are stressed easily and it helps if they can hide between the plants. Further it is important to create a little protection from the UVB rays. Your chameleon will know when it needs to get out of the “sun” and it will hide under leaves. 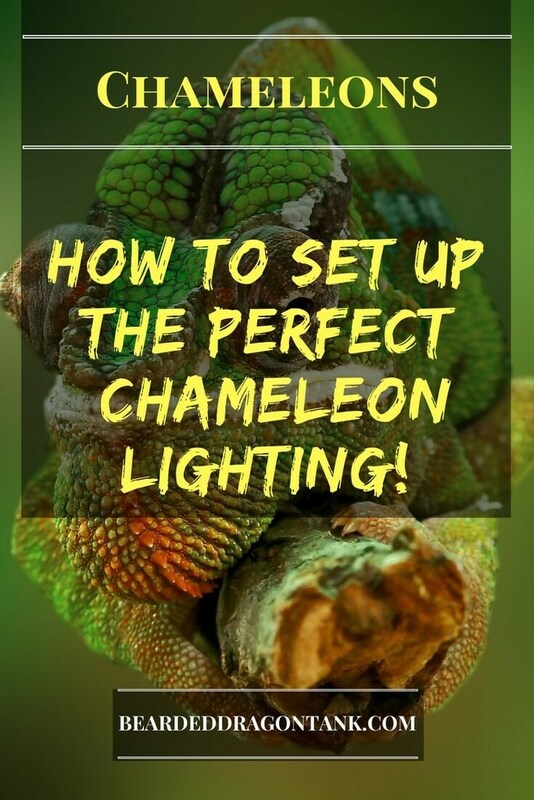 Lighting for chameleons isn´t that hard if you know what bulbs you need and what temperature your chameleon needs. Always stay away from coiled light bulbs. Some of them are known for doing damage to chameleon´s eyes. I really hope this article helped you. If you have any questions, leave a message in the comment section below and I will be more than happy to help you out.